My day starts the same way every morning. The cats meow desperately at the front door so I pour them each a bowl of kibble before letting them in. They race to their bowls and I shut the door quickly before Dubya (named for his IQ) a young but gracefully plumed rooster gets in the house and steals their food. The cats, who until recently ate outside where they had to battle poultry for their meal, scarf up their breakfast like Power-vacs. I feed them inside now so all my cat food money doesn't go to the birds (sorry couldn't help that one!). Next I go and open the mesh cage of the newest member of our family, a two-month old chick (also a rooster) who cheeps sweetly and hops on my shoulder. He's charming right now but I know that one day he'll be as big a pain as Dubya. After my morning hello, the chick flies off my shoulder and chicken-walks into the yard to look for bugs - but he spends most of his day on the deck trying to get in the house. Meanwhile my otherwise beautiful deck is perpetually covered in chicken poo. Now you are probably asking why I let my life get run over by chickens. The roosters crow all night (some I have discovered, talk in their sleep), all morning and sometimes hop right up onto the deck table next to my desk window and crow their lungs out when I'm on the verge of typing a fragile and brilliant thought. But my son loves them. He's raised them from chicks and they are his beloved pets. Before this he raised pond fish, collected and bred geckos, kept mice we caught in the yard, saved myna birds from dog attacks and nursed them back to health, brought home mangy, starving dogs that we treated and either kept or found homes for and (this was the worst) built a centipede farm. The boy loves animals but unfortunately for him there's not much variety on Tahiti. If you look at a map you'll see that we're smack dab in the middle of the South Pacific with virtually nothing but ocean between us, Australia and South America. Anything (animal, vegetable or mineral) that couldn't swim, float or fly here didn't make it this far. When the first Polynesians arrived they, along with their dogs, pigs and stowaway rats were the first mammals to set foot here. These same Polynesians even brought the first coconut trees (that are famous for floating thousands of kilometers and sprouting on sand spits) - that's how far away and un-biologically diverse we are compared even to the island groups to the west of us. There are no snakes, no poisonous insects (but centipede bites sure hurt!) and nothing really scary. 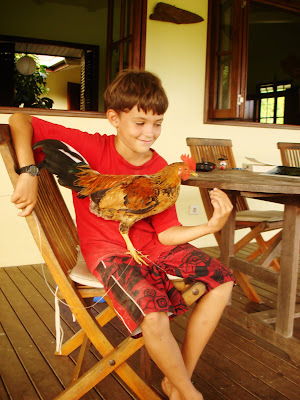 So my animal-loving son plays with chickens and I put up with it. And the truth is, I love them too as long as they don't poop in the house.